Zooming into the dies offers a better understanding of what is under the hood. We know all about the Core H-series CPU as it is legion amongst gaming laptops. Intel sought fit to keep it to the Kaby Lake architecture rather than jump on over to the more-core Coffee Lake, which is sensible in this context. The Radeon graphics have been unknown thus far. Intel has asked AMD to produce a custom chip for its gaming-notebook aspirations. This takes the form of a GCN 5th Generation Vega core composed of, in its fullest form, 24 Compute Units that combine to offer 1,536 shaders. It is likely to have 96 texture units and 32 ROPs, going by the composition of discrete Radeon GPUs, but as this is wholly Intel's specification, the design may have been tweaked. 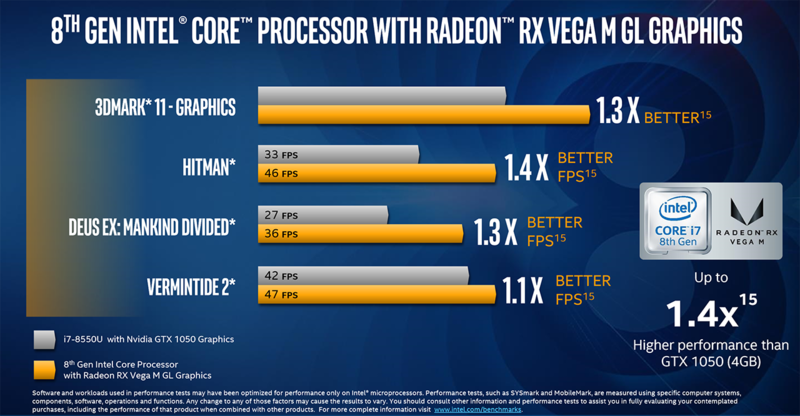 1,536 RX Vega-class shaders connected to 4GB of HBM2 memory over the EMIB interface offers reasonable back-of-the-envelope power. Knowing what we do about desktop RX Vega 56 and 64, this custom part ought to be solid at 1080p in most of today's games - just where Intel needs it to excel. Other Radeon-specific features such as FreeSync are present, but it will be up to the laptop maker to implement them on a case-by-case basis. One of the more interesting upshots is that both the Radeon RX Vega and Intel IGPs are present in this package. That leads on to a possibility of three Intel displays - more useful for low-power video playback and general battery life - plus up to six outputs from the Radeon GPU. Again, it will be up to the eventual laptop maker to decide how to plumb these out and, more importantly, when to use which display engine. 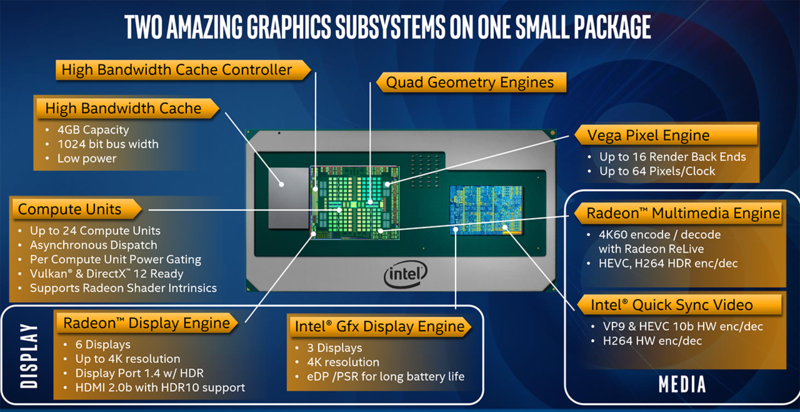 Intel is to offer five variants of this chip to the market, comprising four Core i7 processors and a solitary Core i5. These chips, suffixed by G, all use a quad-core, eight-thread CPU that's abundantly familiar. In specifications alone, there's very little between the first two, Core i7-8809G and Core i7-8709G, save for 100MHz extra boost speed. The real bonus of opting for the premier chip is that it is fully unlocked, which enables the system integrator to toggle the CPU, GPU and memory speeds. This top-line chip is present on the highest-performing G-series gaming notebooks or on the recently-announced NUC 8 Enthusiast SKU. Intel will also use two variants of the AMD graphics. The RX Vega M GH (High) uses the full 24 CUs whilst the GL (Low) makes do with 20 that also run at a lower speed, as shown in the right-hand portion of the spec graphic. Memory speed is also reduced between these two graphics parts, by 10 per cent, and these two measures are in force to reduce the package TDP from 100W down to 65W. Having excellent integration is all well and good, but what about performance? Intel cited a couple of examples in a recent call, so let's go through them both. In the first, comparing a Core i7-8705G chip carrying the lesser RX Vega GL graphics, Intel's testing found it to be comfortably faster than a laptop featuring its own Core i5-8550U chip mated to a discrete GeForce GTX 1050 4GB graphics card. The comparison is somewhat unjust as while the 8550U is also a 4C/8T part, its meagre 15W TDP and all-core speed is much lower than a H-series chip that this should really be compared against. That said, in gaming at 1080p, the 65W Core-i7-8705G appears to be the better bet. In a fairer test, with the 100W TDP Core i7-8809G up against a Core i7-770HQ (built from the same architecture and offering similar boost speeds, remember), the RX Vega GH version is shown to be a touch faster than an equivalent laptop using a GeForce GTX 1060 Max-Q GPU. We can therefore guesstimate that RX Vega GH will most likely be slower than a standard GeForce GTX 1060 GPU. The release of Core G-series processors is important insofar as it shows Intel is getting very serious about the mainstream gaming market for laptops and, later, desktops. By combining its solid CPU cores to Radeon RX Vega technology that appears to be capable of running games at 1080p, all in one package, Intel is offering a one-stop shop to the likes of HP, Dell, Asus, et al., for both graphics and CPU duties. Intel will be controlling software driver releases for the GPU, too, rubberstamping that AMD is simply a solution provider for this venture, and we wonder how OEMs will view these new processors. They appear to offer a solid proposition against going either Intel-plus-discrete-Nvidia or Intel-plus-discrete-AMD for the mass gaming market. Nvidia has most to lose by Intel releasing Core G-series processors, so it will also be interesting to see what the green team does about keeping tier-one laptop makers sweet in the £800-£1,200 gaming laptop market, where it currently enjoys the lion's share of GPU sales. However it pans out, Intel's move to effectively lasso AMD graphics on to a single package is a bold one that has plenty of intrinsic merit. Let's see how the first batch of laptops fare before passing judgement. Tesla dumps Nvidia, will use its own self-driving chips Has Samsung been chosen for Intel Xe GPU manufacturing? This is really interesting. Can't wait to see what type of designs these show up in. I would love some relatively thin-and-light 13“ designs with some serious gaming chops, though the battery life would need to be decent too. Would absolutely love this in a not-too-tiny form factor for a HTPC upgrade too. STX or ITX, so that it fits a decent cooler? Yes please. 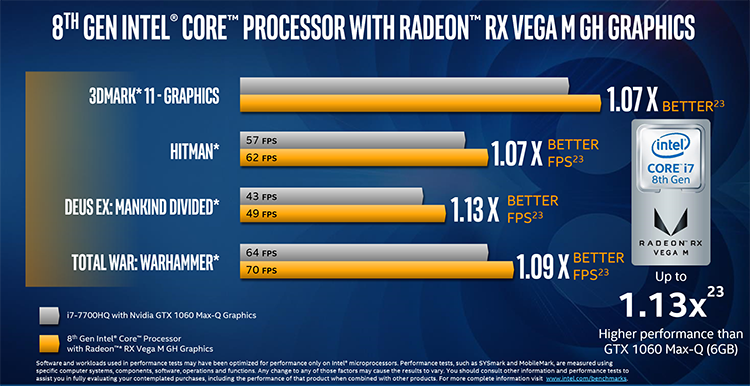 ”In the first, comparing a Core i7-8705G chip carrying the lesser RX Vega GL graphics, Intel's testing found it to be comfortably faster than a laptop featuring its own Core i5-8550U chip mated to a discrete GeForce GTX 1050 4GB graphics card. The comparison is somewhat unjust as while the 8550U is also a 4C/8T part, its meagre 15W TDP and all-core speed is much lower than a H-series chip that this should really be compared against. That said, in gaming at 1080p, the 65W Core-i7-8705G appears to be the better bet."